Steer clear of three common mistakes when organizing children’s outdoor toys. 1. Adding without subtracting. Edit their toys once or twice a year (spring and fall). 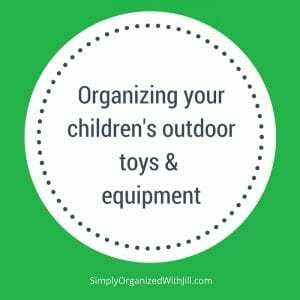 Start by gathering their outdoor equipment and placing it in one area. Now your family has a visual inventory and will notice if there are any unnecessary multiples. Schools and day care centers may accept what you’re ready to share. Toss broken toys. Donate or sell outgrown gear or things they’ve lost interest in. 2. Neglecting to put things away. Things will last longer and not need replacing if they are brought back into the garage or house at the end of the day. You will also improve your home’s curb appeal. Understandably you’ll need to find places to store the toys. Contain them by type on shelves. Use laundry baskets for sand toys, balls and helmets. Plastic dish tubs are perfect containers for small items like sidewalk chalk and bubbles. Use garage walls and rafters to hang rackets, scooters and bikes. 3. Overindulging. You want your kids to be active, but does this mean they need lots of stuff? More stuff will require more work to maintain. You’ll also spend valuable energy reminding your kids to put things away. My 90-year-old dad remembers playing with a hoop and a stick. One neighborhood kid owned THE baseball. When he had to go home, the baseball game was over (I’m not making this stuff up). Those were certainly simple times! Keep the toys to a minimum to allow for more creativity and to leave room for your vehicles.